Oksitosin (Oxt) mangrupa hormon péptida sarta neuropéptida. Oksitosin galibna dijieun di hipotalamus sarta dikaluarkeun ku pituitari posterior, anu boga peran dina beungkeutan sosial, réproduksi séksual, ngalahirkeun, sarta mangsa sanggeus ngalahirkeun. Oksitosin dileupaskeun kana aliran getih salaku hormon ngajawab babatekna sérviks jeung rahim nalika ngajuru atawa rangsangan kana puting nalika nyusuan. Oksitosin kapanggih ku Henry Dale taun 1906, anapon struktur molekulna kapanggih taun 1952. Oksitosin ogé dipaké pikeun natambaan/ngalancarkeun anu ngajuru. Galat skrip: tidak ada modul tersebut. Éstrogén geus kanyahoan bisa ngaronjatkeun sékrési oksitosin sarta ngaronjatkeun éksprési reséptorna,reséptor oksitosin, dina uteuk. Di awéwé, sadosis éstradiol geus cukup pikeun ngundakkeun kadar oksitosin dina sirkulasi. ↑ "Intranasal oxytocin administration is reflected in human saliva". Psychoneuroendocrinology 37 (9): 1582–6. 2012. doi:10.1016/j.psyneuen.2012.02.014. PMID 22436536. ↑ "Salivary levels of oxytocin remain elevated for more than two hours after intranasal oxytocin administration". Neuro Endocrinology Letters 33 (1): 21–5. 2012. PMID 22467107. ↑ Gray's Anatomy: The Anatomical Basis of Clinical Practice (41 ed.). Elsevier Health Sciences. 2015. p. 358. ISBN 978-0-7020-6851-5. ↑ "Nonsocial functions of hypothalamic oxytocin". ISRN Neuroscience 2013: 179272. 2013. doi:10.1155/2013/179272. PMC 4045544. PMID 24967304. http://www.pubmedcentral.nih.gov/articlerender.fcgi?tool=pmcentrez&artid=4045544. ↑ Chiras DD (2012). Human Biology (7th ed.). Sudbury, MA: Jones & Bartlett Learning. p. 262. ISBN 978-0-7637-8345-7. ↑ Dale, H. H (1906). "On some physiological actions of ergot". The Journal of Physiology 34 (3): 163–206. doi:10.1113/jphysiol.1906.sp001148. PMC 1465771. PMID 16992821. http://www.pubmedcentral.nih.gov/articlerender.fcgi?tool=pmcentrez&artid=1465771. ↑ Corey EJ (2012). "Oxytocin". Molecules and Medicine. John Wiley & Sons. ISBN 978-1-118-36173-3. ↑ "Oxytocin: Summary". IUPHAR/BPS guide to pharmacology. International Union of Basic and Clinical Pharmacology. Diakses tanggal 14 December 2016. 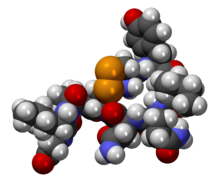 Endogenous oxytocin is a hormone and neuropeptide, which plays a role in social bonding, sexual reproduction and is required during and after childbirth. Purified oxytocin is used clinically. ↑ "Oxytocin". The American Society of Health-System Pharmacists. Diakses tanggal 1 June 2015. ↑ The Oxford Handbook of Prosocial Behavior. Oxford University Press. 2015. p. 354. ISBN 978-0-19-539981-3. ↑ Goldstein I, Meston CM, Davis S, Traish A (17 November 2005). Women's Sexual Function and Dysfunction: Study, Diagnosis and Treatment. CRC Press. pp. 205–. ISBN 978-1-84214-263-9. ↑ "Oxytocin and Estrogen Receptor β in the Brain: An Overview". Frontiers in Endocrinology 6: 160. 2015. doi:10.3389/fendo.2015.00160. PMC 4606117. PMID 26528239. http://www.pubmedcentral.nih.gov/articlerender.fcgi?tool=pmcentrez&artid=4606117. Fillod O (2014), "Oxytocin as proximal cause of 'maternal instinct': weak science, post-feminism, and the hormones of mystique", di Schmitz S, Höppner G, Gendered neurocultures: feminist and queer perspectives on current brain discourses, challenge GENDER, 2, Wien: Zaglossus, ISBN 9783902902122. Yong E (13 November 2015), "The weak science behind the wrongly named moral molecule", The Atlantic . Kaca ieu panungtungan diédit 24 Maret 2019, jam 20.18.